in performance: Lyric Opera Baltimore's Passionate "Tosca"
Grand opera delights in the ‘bigger is better’ motto. However, often it is the attention to detail that really makes the work transcendent. Lyric Opera Baltimore‘s opening night of Puccini’s Tosca was a fascinating display of counterparts that all come together to create a taut stage production offering opportunities for Cavaradossi, Tosca, and Scarpia to shine. The keen eye and love of the art form that bursts forth from Director James Harp is clearly evident in this production. Gardner and Aceto’s stage presence was wholly opposite and in itself another counterweight to the sweet, humourous, and dedicated lovers. Aceto plays his Scarpia as the ultimate snake in the grass knowing exactly how to bait the jealous Tosca — “Quanto promessa nel tuo pronto sospetto!” (How much promise there is in your ready suspicion.) Aceto was able to change his vocal tone color to appropriately convey the differences between seeking Tosca’s affections and his blatant willingness to brutally violate her. Aceto, bathed in a sinister red spotlight at the end of Act I, sang “Tosca, mi fai dimenticare Iddio!” with terrifying intensity. The climactic moments at the end of Act II between Gardner and Aceto, however, were certainly moving but left something to be desired. While Gardner displayed a lovely warmth and enveloping sound in earlier scenes, she seemed to choose a much more defiant and straightforward approach to the illustrious “Vissi d’arte.” It had the impression of too much emotion in the voice while the “Mi vuoi supplice ai tuoi piedi!” that followed the aria was much more effective and not as overwrought. François Loup as the Sacristan was such an inspired choice for Lyric Opera Baltimore given his ability to engage an audience from the very first movement he makes on stage (a sneeze under a blanket at that.) What M. Loup seems to instinctively understand is that every moment on stage is a choice. One does not need to make grand aimless gestures to be part of a grand opera. For all of Vania’s eagerness in the first scene, there was Loup to balance the actions and make it seem more believable. David Sadlier as Spoletta, Phillip Collister as the Jailer, and John Moses as the Shepherd Boy also added life and skilled singing to the production. Steven White did not let the brass get away with having all the fun with Puccini’s score. He absolutely caressed some of the finely played lines from the woodwinds and strings – showing some real pathos in Act III. Finally the Lyric Opera Baltimore Chorus joined by the Maryland State Boychoir was incapable of being subdued in their fantastic “Te Deum” which was something of a feast for almost all of the senses with the incense from four thuribles spreading throughout the gorgeous set. Surely, it makes one look forward to hearing them in Verdi’s “Va, pensiero” in their spring production of Nabucco. When it comes to Lyric Opera Baltimore, their vision of grand opera is not simply that bigger is better but that better is better. They are certainly an institution of which Baltimore should be exceedingly proud. 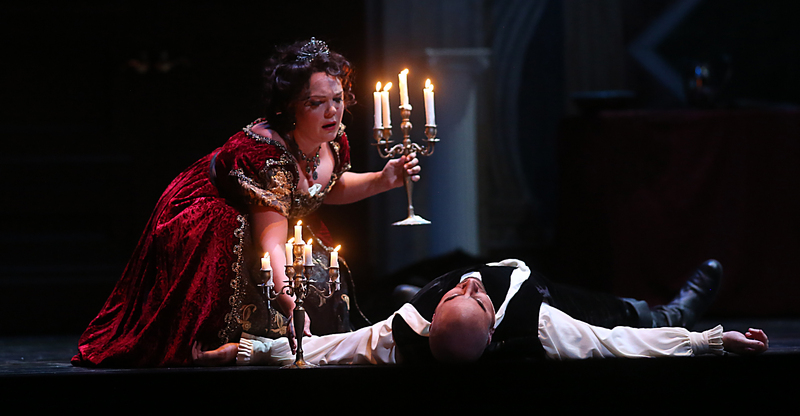 Tosca is an opera of happenings and Lyric Opera Baltimore delivered a passionate and enthralling performance.